Prof. Caetano R. Miranda from University of São Paulo, Brazil, and Prof. LIANG Yunfeng from University of Tokyo, Japan, visited Institute of Solid States of Physics (ISSP), CAS, from January 8 to 17. Discussion and cooperative researches were made on the modeling of irradiation and corrosion effects on structure evolution of metals between the two external experts and Prof. LIU Changsong’s team in ISSP during their visit. In the last three years, LIU’s research team has maintained continuous cooperation with Prof. Miranda’s team. This routine visit was previously scheduled in a Brazil�CChina collaborative research project “Computational Design of Nanostructured Materials for Environmental applications at extreme and harsh conditions” in computational nanotechnology. During their visit, the two external experts were introduced the laboratory for manufacture, test and characterization of nuclear materials in ISSP and discussed the future experimental collaboration. In a seminar attended by the two external experts and LIU’ team, they introduced the new research progress in each team and have a detailed discussion on some new modeling results of LIU’s team, including the microstructure evolution in the nano-tungsten under irradiation, the corrosion of liquid PbBi eutectic alloy to martensite steels. 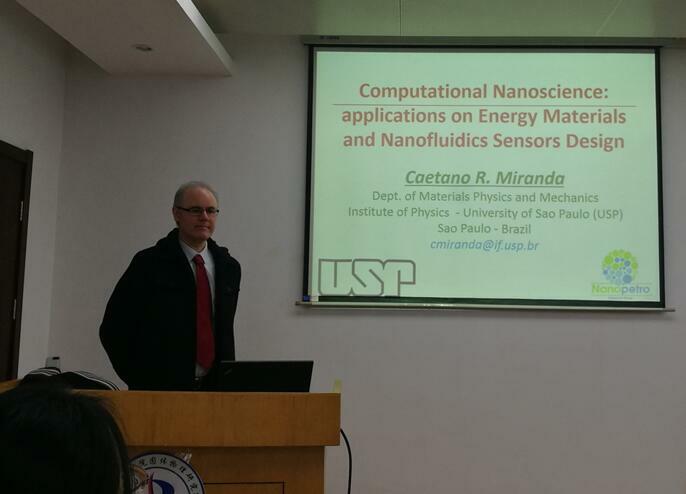 In the morning on 16th Jan, Miranda gave a talk titled “Computational Nanoscience: applications on Energy Materials and Nanofluidics Sensors Design”, at the 66th forum, arranged by The United Youth Research League of ISSP. In the talk, Prof. Miranda introduced the new multiscale modeling methodology, includeing the bottom-up and top-down schemes, in research of nanostructure functional materials and devices. He also presented some new results of his research team, including confined fluidics at nanoscale, and nanostructure device design for energy storage and conversion (oil recovery and solar fuels photocatalyst processes). Caetano R. Miranda, Professor in Department of Mechanics and Materials Physics, Institute of Physics, University of São Paulo, Brazil. He works mainly in the area of computer simulation of materials, applied to energy and environmental issues, nanotechnology for the oil industry and construction materials, physics and materials under extreme conditions. LIANG Yunfeng, Professor, Center for Engineering, Research into Artifacts, University of Tokyo, Japan. He works mainly in the area of computer simulation of nanotechnology for the energy and environmental industry, and high pressure geological science.